On the morning of August 19, 1991 I was eating breakfast and watching news on my TV (something like this) when the announcer reverted to the official voice they used when someone died and announced that due to the health reasons M.S.Gorbachev can no longer perform his duties and the control of the country is being taken over by a State Committee of the State of Emergency. This was the beginning of the 1991 Soviet coup d’état attempt. People had different reactions to the events; I for one wasn’t surprised at all: many people weren’t happy about Gorbachev’s reforms and were hoping for some form of reversal, and this was just what they were asking for. This is what their first press-conference looked like (in Russian). For a group of conspirators they acted too strange and spaced out. Some of them were not exactly well-known before the events. The coup was over in 3 days with the press and the army refusing to support the conspirators and suppress demonstrations in Moscow and other places. Gorbachev returned to Moscow but never regained his full capacity and the USSR was over before the year’s end. One might say that right there over my breakfast I witnessed the beginning of the end of the country I grew up in. Recently I had a chance to find out how these events were covered in the American press. 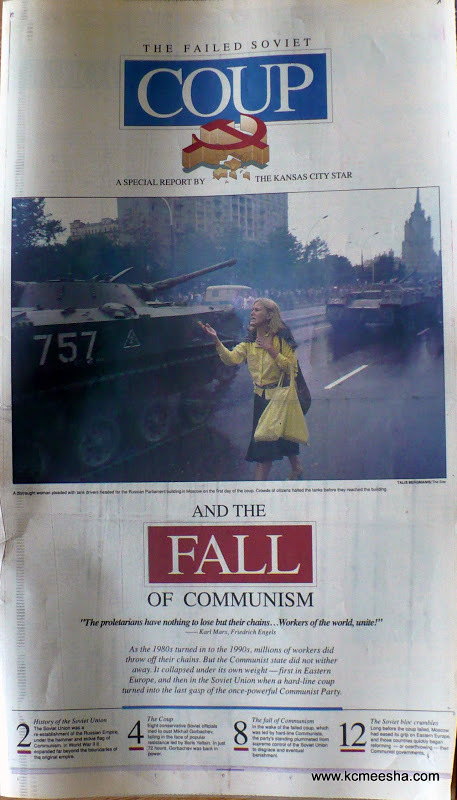 After the the putsch was over the Kansas City Star combined all of its coverage into a special insert. 18 years later people still argue if this was the right way to go. At that time it probably couldn’t go in any other way, but every forum is overloaded with people mourning the loss of the USSR – the superpower. I witnessed it then and thanks to one of my readers had a chance to revisit it now from the other side of where the Iron Curtain used to be. More videos of the American news coverage.